Most people use image editors to retouch their photos or create simple designs for their documents, emails or web pages. Therefore, most image editors share a number of commonly used features such as red-eye removal and contrast or hue controls. This means that there’s often not much to discover when it comes to using such software. Users might find Pixopedia to be a bit different in this respect. Other applications also feature configurable brushes. This one, however, stands out from the rest because of the variety of settings the user has access to. There are a some of presets, including textured brushes available, but the number of controls and customization options leaves a lot of room for experimentation. The left panel of the main window features a large number of filter and effect categories, ranging from common ones such as blur or sharpen to more curious examples, such as Highpass, Dilate and Top Hat. These, like the brushes, can be thoroughly customized and users can apply them either through the above-mentioned brushes or to selected areas of the image in order to create various results. For those who want to delve deeper into image editing and automation using Pixopedia, the application supports both third-party plugins or LUA scripts and comes with small collection of examples to help users get started. 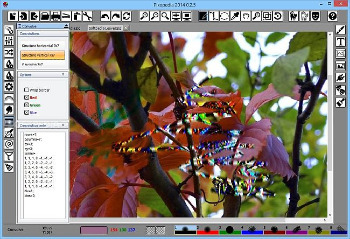 Pixopedia is a surprisingly well featured image editor that supports a number of tools one would come to expect of such a piece of software, and some that seem to be a bit more exotic. However, while using it to experiment with its various filters, brushes, effects and their options and settings can be very entertaining, putting this application to more serious uses may be a bit daunting because of its cumbersome and sometimes unintuitive interface. • Every brush has it’s own settings, color, texture, background tile and other parameters. • Tools, actions, brush parameters are created as sticky forms. Forms can be detached and moved freely. This is useful when working with extended desktop with two monitors. • New drawing engine implemented: every shape border is drawn with current brush. Interior drawing of closed shapes uses it’s own parameters. • New undo buffer engine: single stroke undo/redo, multiple strokes undo/redo (ornaments). Every layer has it’s own undo buffer. • Lot of internal changes (new virtual drawing surface). • Ad hoc adaptive convolution now displays proper modal form. • Image warping action: selection bound added (where possible). There are three types of selection bound: source, destination and both. • Colors action: Statistical correction mode added. This mode adjusts image pixels according to statistical data taken from another image. • Spreader action: new spreading mode added – Neighbour shuffler, with 5 sub modes: Random neighbour, Neighbour group – best luminance, Neighbour group – worst luminance, Neighbour group – luminance range and Neighbour group average. • New brush added: CML brush. CML stands for coupled map lattice, a model for simulating non-linear dynamical systems. A bunch of parameters for controlling brush behavior. Very interesting and cool strokes can be drawn using this type of brush. To see how it works, use big brush tips (50-70).